THE typical entrepreneur is changing, but co-working spaces are yet to catch up. Sheree Rubinstein is tackling this by providing homely co-working spaces for female entrepreneurs, where aesthetic and lifestyle is key. Dark, dingy 'boy's clubs' will be a thing of the past if 27-year-old Rubinstein gets her way. She recently opened another co-working space in Melbourne to prove it. "The female sector hasn't been paid much attention to yet in co-working, and there's still a slant towards catering for techies only," says Rubinstein. "We recognise that aesthetic and physical space is still so important in the digital age." Because everyone likes the comforts of home, even though many may like the excitement of the unknown, Rubinstein saw an opportunity to transform beautiful homes into co-working spaces. One Roof Co-working was born, and with Rubinstein's own goal of trading routine and stability for freedom and uncertainty, the City of Angels seemed the best stomping ground for such a pursuit. She piloted the idea in her hometown Melbourne first as a one-week pop-up in St Kilda, finding synergy with friend and now business partner Gianna Wurzl. "Gianna is from LA and we were both running business and women events separately down in Melbourne at the time," says Rubinstein. "Gianna was always going back to LA; it's where her life is, and Melbourne is my life and where I want to be. Our business partnership actually works really well because of that." 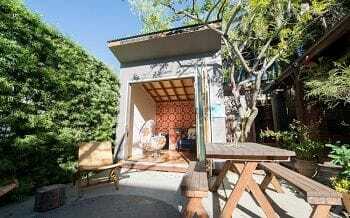 The travelling popup's hard launch took place in Venice Beach last year, with their first permanent residence being a large eastern-inspired home just off the trendy Abbott Kinney stretch. This area is fast becoming known as Silicon Beach due to the tech community moving in. "We chose Venice Beach because there wasn't a lot in the area co-working wise," says Rubinstein. "There's a beautiful blend of business and bohemian, yet there's also a startup orientation and that's exactly what we wanted." This lifestyle is worlds apart from where Rubinstein's career began. Formerly a lawyer, Rubinstein says deep down she always knew it wasn't for her, although is fortunate to have found her passion for empowering women through the process. "I was challenged which is great, but I just stopped caring about the outcome either way," says Rubinstein. "That care is so important." After rummaging with inner conflict and external pressure to stick with law - 'I am a Type A personality after all' - Rubinstein left the law at the end of 2013. She admits there is less security in this line of work. In One Roof's infancy, the duo operated with a 'really low budget' despite seeking out properties in expensive pockets like Venice Beach. Rubinstein says they would find properties on Airbnb which they could rent out for a month and then move on to the next. 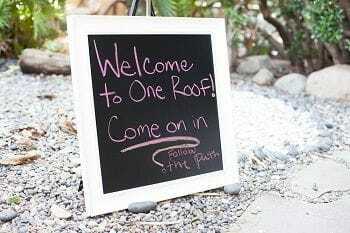 Now, One Roof residences are leased in a more traditional manner. "The problem is people want to know where you will be in the mid-term at least," says Rubinstein. "You want to be as risk-averse as possible in law, but then you take on as much risk as possible with this, which is kind of exciting at first." Rubinstein also says it was interesting to see the differences between attitudes to business in LA compared to Melbourne. "People don't want to pay for just co-working in LA, they'd prefer to pay more for the events like yoga and brainstorming sessions," says Rubinstein. "We learnt really quickly that in LA you need a name, they need to know your story and they care a lot about finance and venture capital - no one asks who is backing you in Australia." Pictured top left: Sheree Rubinstein (L) & Gianna Wurzl (R).